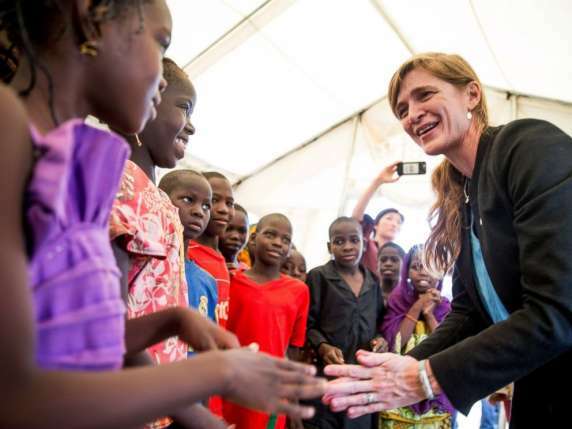 One of the vehicles in the convoy of the U.S ambassador to the United Nations, Samantha Power, on Monday, April 18, crushed a boy to his death in Cameroon. According to Washington Post, Power's motorcade was moving on a high speed down a two-lane roadway in the violence-prone area of northern Cameroon when it struck down the boy. The ambassador was said to be visiting the refugee camps and talking with local officials about the threat posed by Boko Haram in the region. Power's convoy passed near the small city of Maroua while en route to a refugee camp, and according to Cameroonian media, villagers lined the road to watch the motorcade speed past. Surprisingly, a 7-year-old boy was said to have dashed into the road, and the sixth car in the motorcade - an armored Jeep, had no time to swerve away, multiple reports said. It was gathered that the driver of the vehicle was a Cameroonian. It was however uncertain if was employed by the U.S. Embassy or was part of a local police guard escorting Power, several aides and journalists. The Associated Press reported that just before the child was struck, a man was observed running to the street with his arms raised high in an attempt to stop the child. The driver stopped the car, but U.S. security forces ordered him to leave because the area was unsecure. The injured boy was treated by medics in an ambulance accompanying the caravan and was transported to a hospital, AP said. According to the U.S. mission to the United Nations, Power returned to the scene later in the day to meet with the boy’s family and extend her condolences in person.